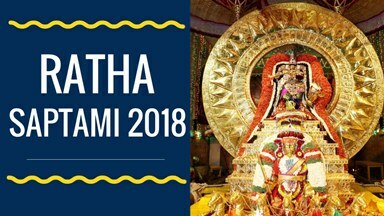 2018 Ratha Saptami Date & Vahanam Timings Schedule Tirumala, Tirupati (AP): Ratha saptami 2018 date & schedule was announced by ttd officials @ tirumala.org website. Due to Ratha saptami festival day TTD will perform Suryaprabha Vahanam, Chinnasesha Vahanam, Garuda Vahanam, Hanumantha Vahanam, Chakrasnanam, Kalpavruksha Vahanam, Sarvabhoopala Vahanam to Lord Malayappa swamy (Sri venkateswara swamy). Lakhs of venkateswara swamy devotees will come to tirumala for Vahanam darshanam. Already TTD Room Accommodation booking for Tirumala ratha saptami festival quota was released at www.ttdsevaonline.com. So who want Accommodation on ratha saptami day those can book at official website of TTD. NOTE: Special Darshan & VIP Break darshan, NRI Darshan, Infant Below 1 Year Babies, Senior Citizen, & All Privileged darshan will be Not Available on the day of ratha saptami. Due to havy rush crowd in Tirumala. Because of ratha saptami festival day, In the Day of Ratha saptami lakhs of devotees will come to tirumala for Vahanam Darshan in tirumada streets, Tirumala. For more information about tirumala tirupathi devastanams (TTD) ratha saptami 2018 schedule & darshan timings please visit official website of TTD www.tirumala.org.